Eradicator and its employees take pride in taking the necessary steps to remove abnormal levels of basement mold within a client’s property. One example of a specific area within the home that is mostly susceptible to abnormal mold growth is the basement. The basement of a property is usually underground and in certain weather climates this can result in being cold in the winter and cooler in the summer months. This type of atmosphere creates an increase in humidity that may provide the right scenario for abnormal mold growth. Additionally the basement is highly susceptible to water intrusion. Sub pumps are located within this part of the home. The purpose of the sub pump is to remove excess water from the property’s foundation. As like any mechanical device it has the ability to fail and if this does occur excess water that should have been removed from the home has now compromised the home’s foundation. 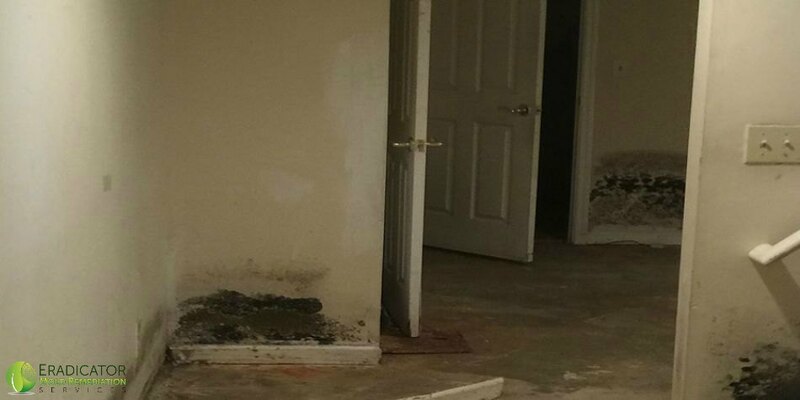 If this issue does occur and the property owner is unaware or pays no attention then this scenario can cause abnormal mold issues to develop. With the basement also being underground several other scenarios can lead to abnormal mold growth. If the property has faulty windows then excess water can seep into the home without the knowledge of the property owner. Windows should be properly caulked and maintained to prevent excess water from compromising the home’s foundation. Gutters and Down spouts should also be maintained or upgraded to ensure water is effectively being removed from the property and not seeping into the home’s foundation. With all these scenario’s the presence of moisture and/or water may lead to abnormal levels of mold activity once porous materials such as drywall has become absorbed. If this is not fixed quickly then the scenario created can lead to devastating results. If you are aware of issues mentioned that may compromise your property’s structure then immediately investigate as well as contact Eradicator’s personnel to determine if our services are right for your scenario. Eradicator’s mold inspector will review your property, determine if mold testing is necessary, and provide a list of mold removal protocols we will utilize to effectively remove the affected materials and return your home to a normal level of fungal activity.